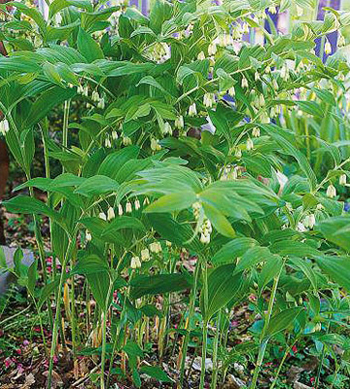 Solomon’s seal is a perennial plant; the thick, horizontal, scarred rootstock produces 1 or 2 erect stems, 1-3 feet high, whose lower half is naked and upper half leafy. The alternate, elliptic to ovate leaves are green with a whitish bloom underneath. 2 to 5 or more greenish-white, bell-shaped flowers hang from the leaf axils from April to August. The fruit is a blue or blue-black berry. Another variety: Other species of Solomon’s seal have similar properties. A European variety (P. odoratum) contains a substance that lowers the level of blood sugar. This variety has long been used in the Orient for diabetes and is included in many tea mixtures designed to lower blood sugar. Solomon’s seal was so called probably from starlike markings on the rootstock, supposedly reminding us of the Star of David. Another herb (Smilacina amplexicaulis) is known as Solomon’s seal. Paiute name “Shapui”; Shoshone name “Roy”; The tea from roots for female trouble and internal pains. Solomon’s seal is reported to take away, in 1 or 2 nights, bruises, black eyes, burning heat of wounds, etc. Also, it will strengthen gums and fasten loosened teeth. Mainly for external problems. Makes a good poultice for bruises, inflammations, piles, sores, and wounds and a good wash for skin problems, acne, freckles, and blemishes. Has been used as a wash to relieve poison-ivy. Native Americans made a tea of the rootstock to take for women’s complaints, indigestion, general debility, infertility, diabetes, consumption, dry cough, dehydration, malnutrition, broken bones, promote sound sleep, treat coughs, menopause, laxative, lung ailments, and general internal pains. The fresh root was poulticed, or root tea used externally as a wash, for cuts, bruises, sores, carbuncles, rheumatism, arthritis, and skin irritations.